Built in 1896 at Madison, Ind., the wooden hull of the towboat Gleaner measured 185 feet in length by 35 feet in width. Five boilers supplied steam to engines (24-inch cylinders with an 8-foot stroke) recycled from the towboat Jay Gould (built 1880), which was dismantled at Madison as the Gleaner was under construction. Owned by the St. Louis & Mississippi Valley Transportation Company, on its first trip the Gleaner towed the stripped-down hull of the Jay Gould to St. Louis. In November 1901, the boat was sold to the Peoples Coal Company of Pittsburgh. A year later, the towboat was taken to Marietta, Ohio, and the original engines were replaced with ones having 28.5-inch cylinders with an 8-1/2-foot stroke. The replacement engines were touted to be new, but The Waterways Journal reported them as having come from the 1877-built towboat John Porter. During the severe winter of 1902, the Gleaner was drydocked at Cincinnati for the replacement of the hog chain system. The rejuvenated riverboat came out in March 1903, with Capt. John Case as master with Capts. Henry Lindenburn and Jason Curtis presiding in the pilothouse. In October 1904, the towboat was again at Marietta, for the replacement of the cylinder timbers. This was hampered by a delay of two months due to the stranding of the towboat Venice (and the barge carrying the timbers) in the Monongahela River at Merriman’s Riffle. While at Marietta, the Gleaner also received a sixth boiler. With work completed, the towboat departed for Pittsburgh on December 28, 1904. 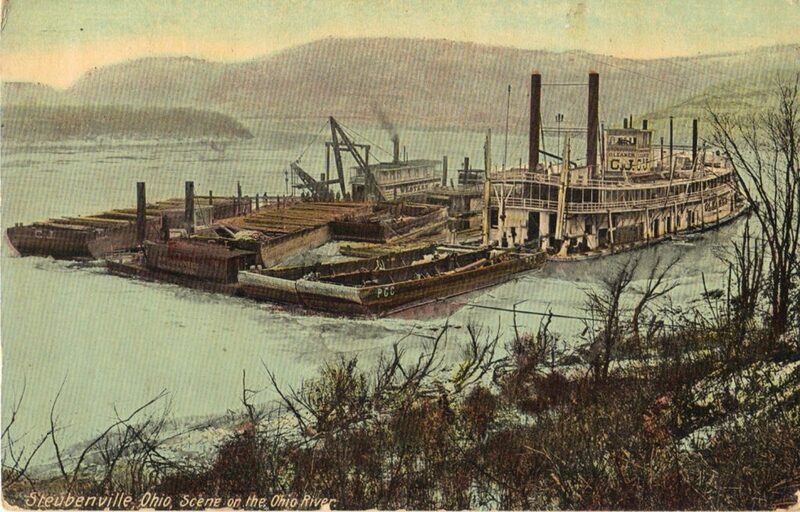 The steamboat was sold in 1908 to the West Kentucky Coal Company. 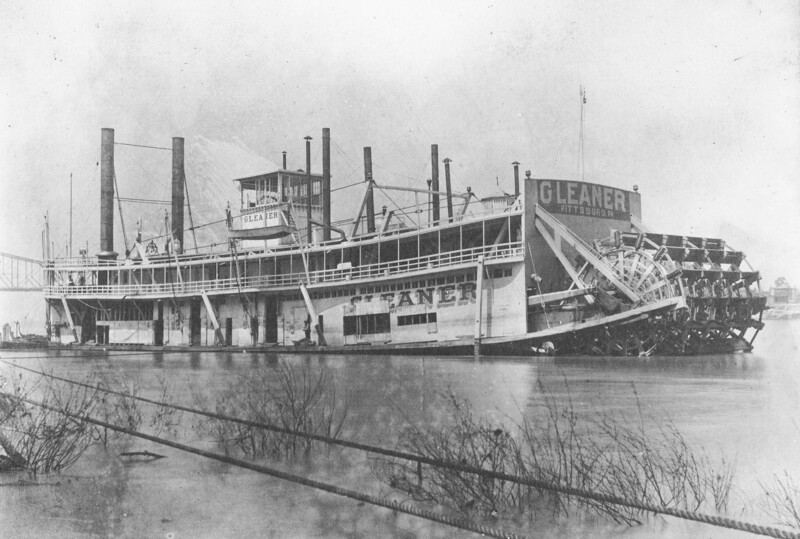 During their ownership the boat was sunk, along with 30 barges of coal, by a storm on June 13, 1912, at Plaquemine, La. Capt. William Crow was master for West Kentucky Coal, with Capt. Henry Nye (formerly on the famous towboat Sprague) as pilot. Literally worn out, the Gleaner was beached at Paducah and dismantled in 1918. In a talk given before a river group in 1980, Capt. Ben Gilbert (1904–1991) told of his river career, which began in 1919 during summer vacation from school when he worked as a water boy at the West Kentucky Coal Company’s barge yard at Paducah. After a brief stint as cabin boy on the Ellen Richardson, Gilbert was hired to scrape mud from the hull of the Gleaner while it was undergoing repairs at Paducah. He next signed on as cook’s helper aboard the Gleaner as it was about to depart with a 25-barge tow for New Orleans. The tow consisted of 20 barges of coal for Vicksburg and five barges of grain for New Orleans. The boat laid up every night, requiring the deckhands to run a check line ashore from a yawl, made fast to a convenient tree. The yawls were large (three sets of oars) and often the deck crew went ahead of the tow, taking soundings and setting temporary buoys. Gilbert, who enjoyed a 50-year career as master-pilot, vividly recalled the musical tones “sung” by the roustabout who heaved the lead line into the river and conveyed the water depths to the pilothouse. Editor’s note: For questions or suggestions regarding the Old Boat Column, Keith Norrington may be contacted by e-mail at curatorkeith@yahoo.com, or by mail through the Howard Steamboat Museum at P.O. Box 606, Jeffersonville, Ind. 47131-0606.